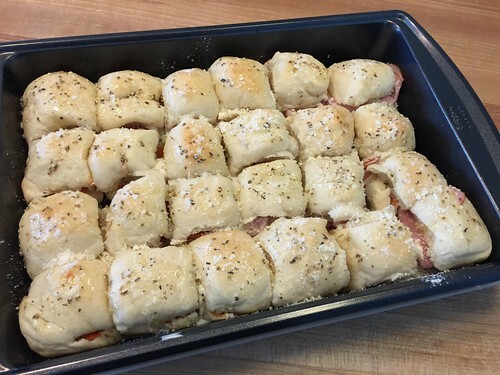 Our favorite varieties are pepperoni pizza sliders and ham pizza sliders — but I can attest that sausage and bacon are yummy too! Often I’ll make half pepperoni and half ham so we can each have a little variety. I serve them with fresh or canned fruit, chips, and a salad or raw veggies — so hardly any work with the side dishes either. In general, this is a winning recipe all the way around! 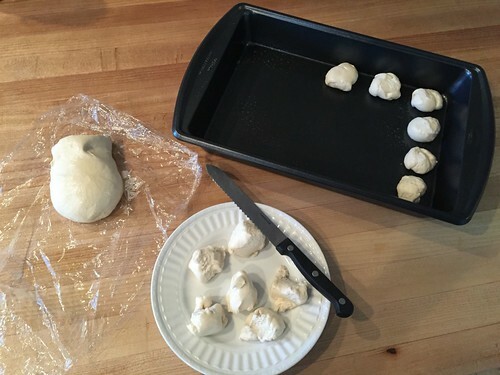 If you’re making your own buns, I would suggest defrosting ONE 1-pound loaf of frozen bread dough and cutting into 24 equal chunks. Let it rise and bake for about 17-20 minutes (don’t over-bake them). 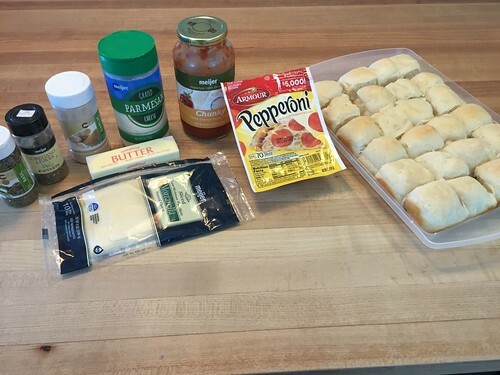 Spread bottoms of buns with a small amount of pasta or pizza sauce and top with meat, cheese, and top bun. 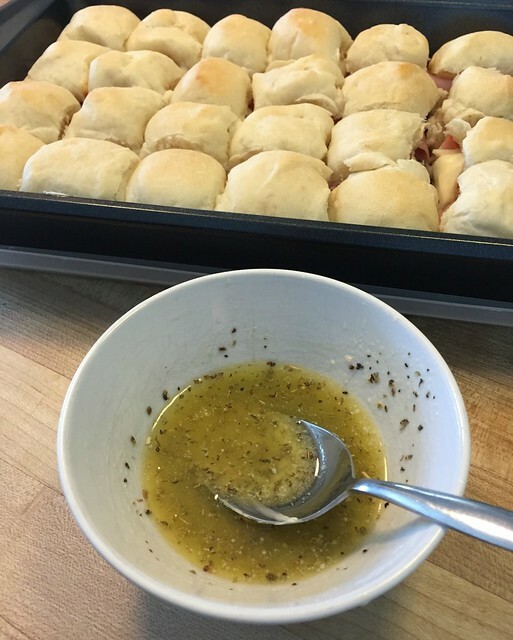 Mix basil, oregano, garlic, salt, and Parmesan into the melted butter and pour over sliders. Sprinkle with additional Parmesan cheese if desired and bake for 15 minutes at 325ºF or until cheese is melty and gooey. I can easily eat 3 or 4 of these ooey, gooey sliders (along with additional sides), and my kids almost always have 2 full sliders. Also, I could see these being a requested “after school snack” once my kids are a little older — probably a better choice than a cookie or a bag of chips too! 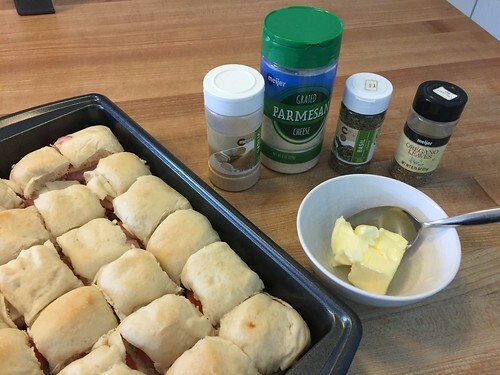 If you’re looking for a quick weeknight dinner, a snack for your kids and their friends, or a simple meal to bring to an upcoming potluck, give these sliders a try. I hope you love them as much as we do! 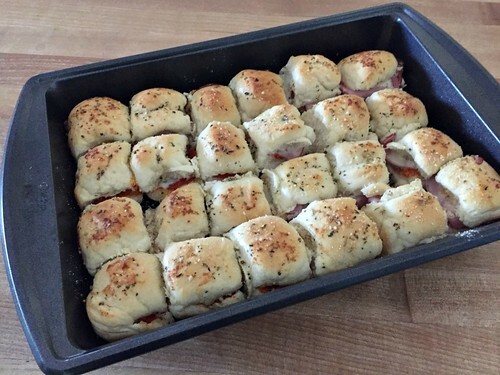 Do you have a favorite slider or baked sandwich recipe? My Great Aunt's Spiced Molasses Cookies! Thanks for the recipe! It was a big hit at our house! I knew this recipe would be a crowd-pleaser for my family but then thought that my daughter might be able to “cook” this by herself. 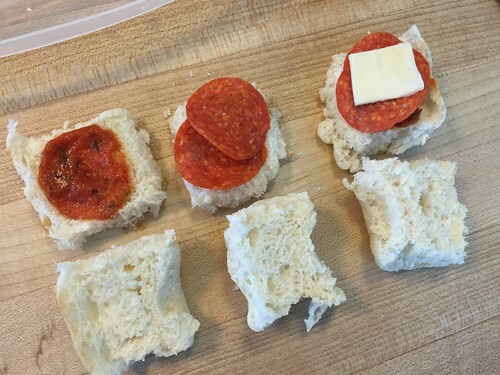 So, tonight, my 8 year old made pizza sliders for our family her very first independently cooked meal! It actually brought tears to my eyes at how very proud she was of herself. Thanks for sharing the recipe & giving us a special night at our home tonight!! Wow — that’s so great! I love it!! Thanks for sharing your little special moment — THIS is one of the many many MANY reasons why I love simple foods! Wondering how well this would work with veggies…we’re vegetarian. I’m concerned that they wouldn’t cook through or the bread would get soggy. I honestly have no idea — but it can’t hurt to give it a try. Or maybe use roasted or grilled veggies instead?? These look amazing! My guys aren’t big fans of tomato sauces or piggy, so I hafta get creative if I want pizza-y stuff. I just now made some with Alfredo and leftover pieces of crock pot chicken – using what I have ;). Everything else was the same as your recipe. glad to hear you mixed it up to use what you have in the house — that’s my favorite part of cooking! 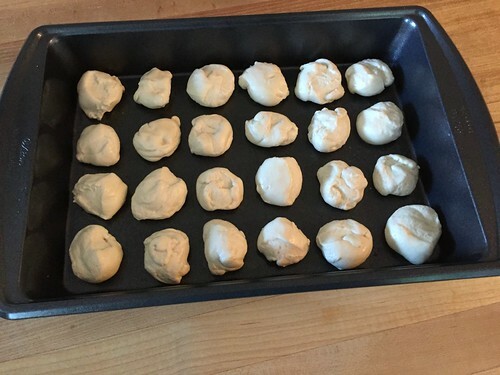 Those look yummy – will definitely try them! I do have a favorite baked sandwich recipe. It’s your ham and cheese baked sandwich recipe! They’re so delicious. YUM! haha –thanks! 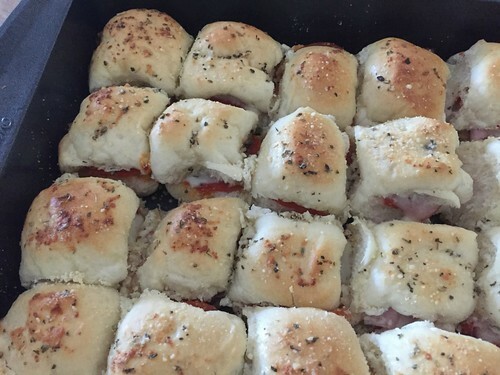 The ham and cheese sammies are still my favorite, but Dave and the kids all LOOOOVE the pepperoni pizza sliders! 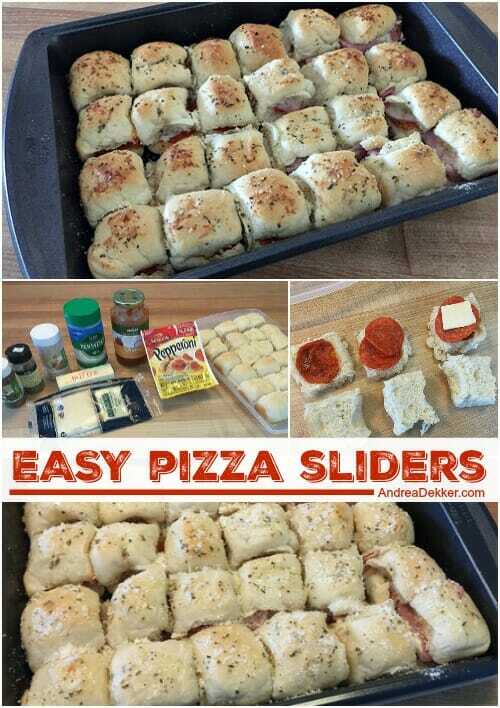 This looks perfect for our NFL tailgate parties we have. I’m making this for the first season opener. Thanks for sharing. Oh yeah, these will be perfect! Yum, your sliders sound delicious! I’ve been gathering recipes that are do-able for my teenagers to make and this one will be perfect! 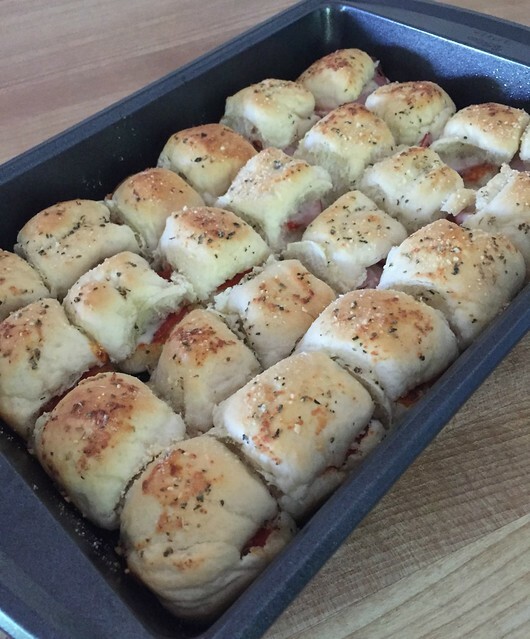 We love sliders and while I’ve made them before, I’m not a very good “outside the box” cook and didn’t think of pizza sliders! I guarantee they’ll be a hit! (And for the record, your Wet Burritos are on the menu for Thursday!) Thanks! Am I crazy or does your recipe say a “pint” of salt instead of a pinch of salt? Funny! These look awesome! I’m still trying not to turn the oven on much because it heats our house up so badly, but I’ll have to try these in the fall. That frozen bread dough is amazing! We make cinnamon rolls with it. So good! 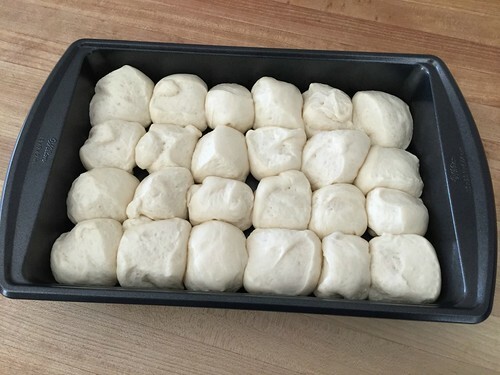 I’ve done small batches of these in our toaster oven too — and yes, the frozen bread dough is one of my favorite things! I’ve already planned our August menu, but these are definitely going on the menu for September! Thanks for this super simple, yummy recipe.